There's always more waiting to happen in our creative lives. If we listen to our hearts and follow that voice, our creative movement will be meaningful and important to us. A source of joy in my creative life is the announcement of a new Limited Edition print of the painting, Honoring the Horse Nation. 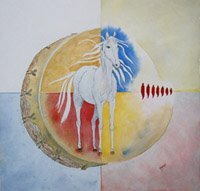 The drum represents a drum group who are singing an honoring song for the Horse Nation and the white horse represents all horses. The drum beat is the heart beat of Mother Earth. This archival quality reproduction is the same size as the original watercolor painting. For more information click my Home Page link on the main page of this blog.